Spontaneous hematoma in an extremity without history of trauma should arouse clinical suspicion and may require imaging and even biopsy. Differential diagnosis ranges from intramuscular aneurysm to soft tissue malignancy. It happens all too frequently — an elderly patient sustains a low-energy fall from standing and hits his or her arm/leg on the ground. The patient may also happen to be on Plavix® or Coumadin® for medical comorbidities. The history matches up with the physical exam, and advanced imaging shows a superficial fluid collection in the area where the contusion injury occurred. But what happens in the same scenario when Mrs. Jones presents with an area of ecchymosis and fullness without the history of trauma? Suppose advanced imaging then shows a large fluid collection that appears consistent with blood. Do you, as the medical caretaker, chalk this up to “poor protoplasm” and assume that this person “bruises” easily and send her on her way? What is in your differential diagnosis? Here are two case examples of patients in whom the “spontaneous hematoma” was more than met the eye. A 64-year-old female presented with a chronic draining distal thigh mass, painless and without a clear trauma history. She was abstinent of Coumadin or other anticoagulant. She reported a 10-year history of slow growth, with increased rapidity over the past eight months. Follow-up in local emergency rooms and with her general surgeon culminated in bandage changes and oral antibiotic treatment due to the perceived “hematoma” that was being treated. When symptoms failed to resolve and MRI was obtained, it showed heterogeneous signal characteristics within a 19-cm mass that suggested a clinical suspicion for something more than a hematoma. A referral was placed to Cleveland Clinic. Because of her troubling history of a “spontaneous” hematoma that did not match her imaging/exam, the mass was biopsied. The first four frozen section specimens revealed bland capsular tissue, but the fifth specimen revealed high-grade myxoid liposarcoma. She was taken for resection and local flap coverage, followed by 60 Gy radiation postoperatively. She is now at five years with no evidence of disease. A 66-year-old male presented with sudden-onset pain and fullness in his left posterior thigh. He denied history of blood thinner medications. An MRI showed a 24-cm mass located in the posterior compartment of his proximal thigh, with a thick rind of low-intensity tissue completely surrounding the mass. Initial MRI findings suggested an evolving hematoma, but clinical suspicion was high. He was admitted and underwent a needle biopsy, which showed only red blood cells and no concerns for malignancy. A subsequent open biopsy, dictated by a clinical suspicion, evacuated more than one liter of blood, and a capsular tissue review revealed a high-grade pleomorphic soft tissue sarcoma. Because of the mass location, the patient underwent a hip disarticulation with a negative margin resection and is now at seven years with no evidence of disease. Figure 1. Coronal T1 (top left) and STIR (top right) imaging show a complex, cystic mass with a high degree of heterogeneity on STIR imaging, more homogeneous in appearance on T1 (this can be typical of “hematomas”). The mass is adjacent to the medial knee joint capsule but does not violate the knee joint. Axial T1 (bottom left) and fat saturation [FS] (bottom right) imaging show a large mass that is adjacent to the medial knee tissues, surrounded by a dark rind on T1/FS sequences. This was thought to represent a “spontaneous hematoma,” but was proven to be a high-grade soft tissue sarcoma following open biopsy. It was later resected and the defect covered with a lateral gastrocnemius flap. When clinicians find themselves in the position of evaluating for a spontaneous hematoma in the extremity without a history that matches the patient’s presentation, clinical suspicion should lead to further imaging and/or biopsy. The differential of a spontaneous hematoma must also include intramuscular aneurysm, intramuscular hemangioma, chronic expanding hematoma and soft tissue malignancy, such as sarcoma or (rarely) soft tissue carcinoma metastases. A history of bleeding tendencies also may increase the chance for a true spontaneous hematoma. While an MRI is typically the best test to assess for soft tissue characteristics of a mass, it is not perfect in distinguishing a hematoma from a soft tissue neoplasm. As a rule of thumb, acute hematomas will show low-intensity T2 and low-to-mid-intensity T1 signal intensity characteristics, while chronic hematomas will be hyperintense to muscle signal on both T1 and T2 imaging sequences. Additionally, a definitive diagnosis can be made especially difficult when a large portion of the tumor is occupied by intratumoral hematoma. Figure 2. 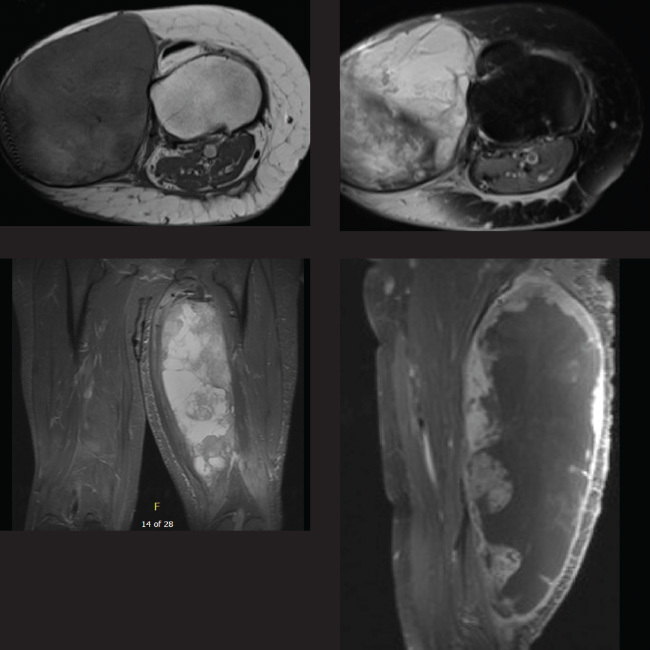 Axial T1 imaging (top left, right) shows a large mass within the posterior compartment of the thigh, with heterogeneous signal characteristics. This was biopsy-proven to represent a high-grade soft tissue sarcoma after multiple needle biopsy passes were nondiagnostic. The patient ultimately underwent a hip disarticulation with a negative margin resection. Beyond imaging, biopsy technique can also help determine an accurate diagnosis, as it has been shown in the past that needle biopsy and cytology review can be misleading. A high degree of clinical suspicion should trigger discussion whether an open biopsy should be conducted if a “negative” needle biopsy does not match the clinical picture. Confirmation with the pathology team should be made, and an abundant amount of tissue should be sent to the lab in order to make an appropriate diagnosis. Because soft tissue sarcoma and muscle malignancies are a rare variant of cancer, high clinical suspicion must be maintained with soft tissue masses. In the setting of a blood-filled mass, it is important to ascertain whether a history of trauma can be correlated. If not, appropriate imaging and biopsy techniques should be planned. A “spontaneous hematoma” is rare, and should not be settled upon as a true diagnosis until cancer has been objectively disproven. At Cleveland Clinic, we have a multidisciplinary team specialized in diagnosing and treating suspicious masses, and we are happy to help expedite the care of your patient in a manner that gives the patient his or her best chance of a successful outcome. Niimi R, Matsumine A, Kusuzaki K, et al. Soft-tissue sarcoma mimicking large haematoma: a report of two cases and review of the literature. J Orthop Surg Hong Kong. 2006;14(1):90-95. Imaizumi S, Morita T, Ogose A, et al. Soft tissue sarcoma mimicking chronic hematoma: value of magnetic resonance imaging in differential diagnosis. J Orthop Sci Off J Jpn Orthop Assoc. 2002;7(1):33-37. Drs. Lietman and Joyce are Co-Directors of the Musculoskeletal Tumor Center. Dr. Mesko is a member of the Department of Orthopaedic Surgery. A site for physicians and healthcare professionals from Cleveland Clinic’s Department of Orthopaedic Surgery, ranked #3 in the nation by U.S. News & World Report. Clinicians and researchers discuss the latest advances in patient care, research, and technology. Orthopaedic Insights helps you stay informed on the latest orthopaedic innovations, research, case studies and medical breakthroughs from Cleveland Clinic Department of Orthopaedic Surgery.